Now that fall is here, it’s the perfect time to finalize outdoor maintenance before the cold temperatures arrive. Your Breckenridge real estate deserves extra protection during the winter months. That’s we’re providing a few essential home projects for good winterization. If you have an outdoor sprinkler system regardless of its use or configuration, you’ll need to have it blown out and winterized to avoid water freezing in the pipes, heads and backflow preventer. Proper sprinkler system winterizing only takes 15 – 20 minutes and it can save you a bundle when you look at the cost of having your system fixed in the spring. The bitter cold may be heading our way, but you don’t have to feel it when you’re in your house. To make sure you’re warm and cozy, take the time now to insulate your home properly. Attics often leak energy. For this reason, it’s a good idea to check your attic sooner rather than later. If you discover areas that don’t keep in the heat, installing insulation is a must. Before it gets frigid outside and you want to enjoy your fireplace, be sure to check it first. Look for chips or cracks and promptly fix any problems you might find. Door gaskets and soot build-up are common issues that often require attention prior to using the fireplace. If you don’t feel confident inspecting this area of your home, it’s wise to hire a professional chimney sweeper. 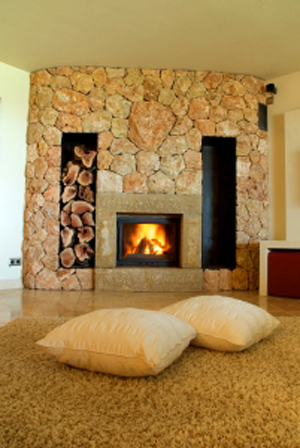 Having an expert evaluate your chimney is worth the cost for your peace of mind. Carpets are known to collect lots of dust, dirt and mold. These pollutants can really affect you once you’re sealed up in your home throughout the winter. This is exactly why it’s so important to give your rugs a thorough steam cleaning now. A professional can get your carpeting cleaned very well, if you would rather go that route. Also, for carpets that may be too old to deep clean anymore, consider replacing them as soon as possible. Or you might want to remove them entirely and put in vinyl or hardwood floors instead. October is Fire Safety Month. This means it’s a great time to make sure you and your family are aware of any fire risks. Each floor of your home should have a fire detector. Test them now and don’t forget to go through this routine every month as well. For extra protection, keep fire extinguishers around your home, particularly in the kitchen and by your fireplace. If you’re thinking of buying or selling a home in the fall or winter, that can take a little extra effort as well. It’s a little harder to get around when it’s snowing and staging a home can be tougher with fewer daylight hours. Teaming up with an experienced Breckenridge Real estate agent can help, so get in touch and we can start the process as soon as you’re ready.